Planning a business event can be quite a task. In order to simplify this task, it is recommended to develop event management apps. Pune, India - February 4, 2019 /MarketersMedia/ — India, Feb 5 2019: Hosting business events can be quite challenging. Right from choosing the venue to finding sponsors, the procedure is quite lengthy and time-consuming which may reduce the time to market the details of event. Event Management Apps make this exercise less tedious and streamline the whole procedure for just an easy click on smartphone. Develop event management apps that are simple and user-friendly. Here are some features that apps must have. Event management apps unify people, processes and technology. These apps become a one-stop solution for all event planning needs. Also can manage speakers, register the attendees, and plan the whole schedule of the event using smartphone. Get the attendees to register online through event management apps and communicate with each of them through mass email tools. Along with registration and can include RSVP features in order to determine the number of attendees for event. Schedule a FREE Demo here at http://www.themobileappmaker.com/events-request-a-demo/ . Also can mail them the schedule, launch surveys to get feedback and also send the profiles of the speakers and other guests of honour. We can also use these apps to generate name badges for each of the attendees and the speakers. Alongside, can send notifications and reminders about the event to the attendees using these event management apps. “The event management apps help to keep costs down and also exceed user expectations at the same time. These apps are a wonderful solution to launch post-event analytics to determine the success of event,” stated Peter Tello, Head of Sales at The Mobile App Maker. The attendees can also upload their business cards on these event management apps that can be converted into contacts to be exchanged with fellow attendees. Also can also add the profiles of the speakers so that the attendees can choose the sessions that they would like to attend. Transform the Business; Request FREE Demo at http://www.themobileappmaker.com/industries/mobile-app-for-event-management/ . Also, can create live polls, campaigns, and contests about upcoming event using these event management apps to generate curiosity among those who plan to attend event. Also can make noise about an upcoming event on different social media networks like FaceBook, Twitter, LinkedIn and others using these event management apps. Simple navigation, easy to use, these apps offer meaningful data, anytime and anywhere. These comprehensive, and time-saving apps will change the way that host a business events drastically. About The Mobile App Maker: Contact http://www.themobileappmaker.com/contact-us/ for the mobile app development experience. 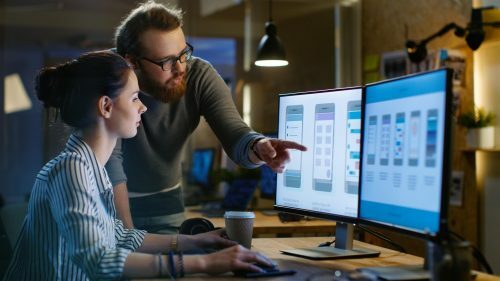 mobile app development platform simplifies the app development process to deliver exciting and intelligent solutions that empower businesses to make a smart decision based on actionable insights, from anywhere-anytime.